Oh, come on. You knew this was coming, didn’t you? You don’t get to my level of peanut butter and chocolate dependence easily. It takes hard work. Daily doses of Reese’s, for instance. That’s a must. So why should it surprise you that I decided to make this bark? It’s just…lovely. Sigh. So much lovelier than any bark ever. Have I mentioned that I like to exaggerate from time to time? 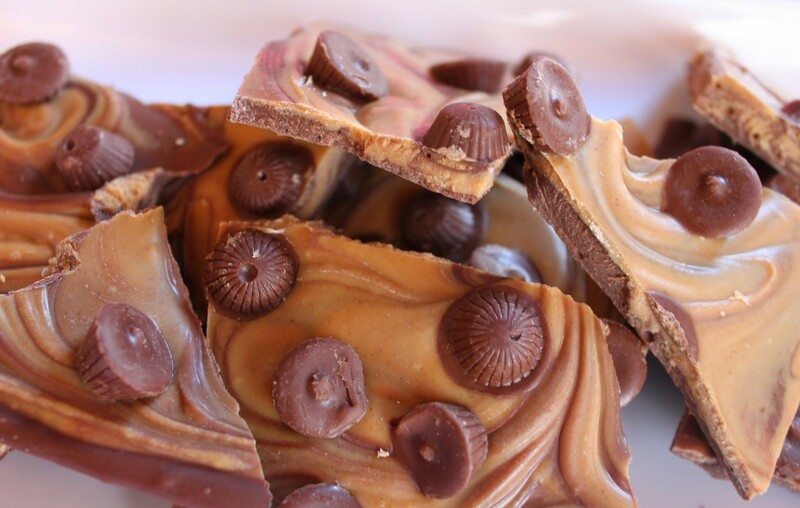 But really, look at those peanut buttery swirls, all dotted with little peanut butter cups. It’s so pretty. A very attractive dessert, which dessert should be if it possibly can. Yes, I’m paraphrasing Jane Austen. I’m an English teacher. And like my cookies and cream bark, this process is short. I had five minutes Sunday morning before our weekly trip to the grocery store with the kids. They were getting into their coats, screeching, and beating each other up. I was peacefully making this bark, murmuring ineffective things like, “Calm down, kids.” Honestly? I didn’t care. I was much too excited to taste this. Sure enough, when we returned from the store, it was ready to eat. I just peeled it off the Silpat and that was that. No muss, no fuss. 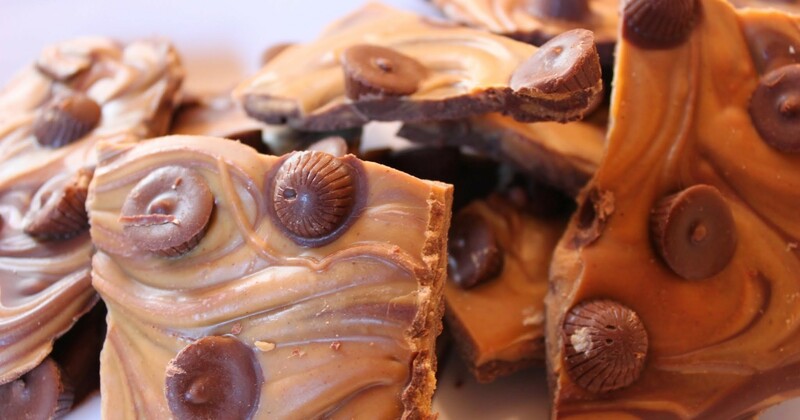 Just lots of peanut buttery goodness! My son was hovering at my elbow while I broke the bark into pieces, and he got quite a few tastes as well. Lucky little fellow. Even though he supposedly doesn’t like chocolate, he was lapping this stuff up. Did I mention it’s easy to make? Let’s do it! Take out two microwave-safe bowls. Line a cookie sheet with parchment paper or Silpat. 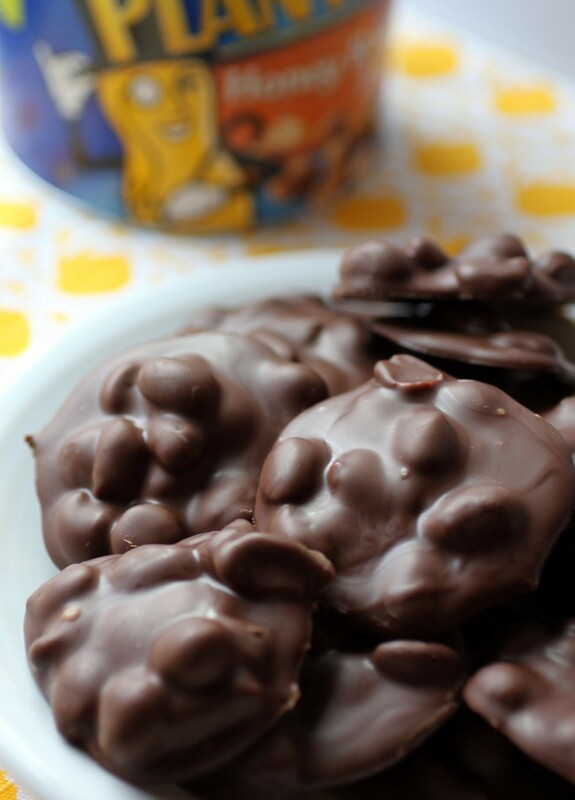 Put the chocolate chips in one bowl and microwave for two minutes. Stir. If the chocolate isn’t melted, keep heating in 30-second intervals, stirring each time, until the chocolate is melted and smooth. 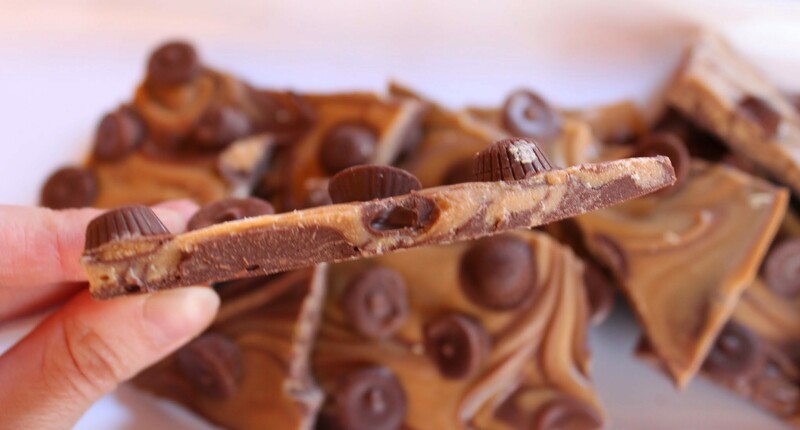 Repeat the process with the peanut butter chips. 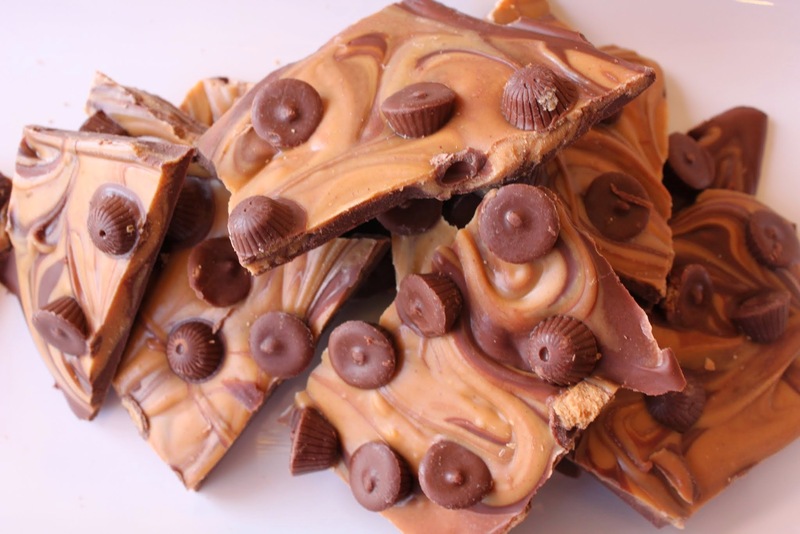 While the peanut butter chips are melting, spread the milk chocolate layer into an even rectangle over your cookie sheet, being sure that the chocolate is spread out evenly. 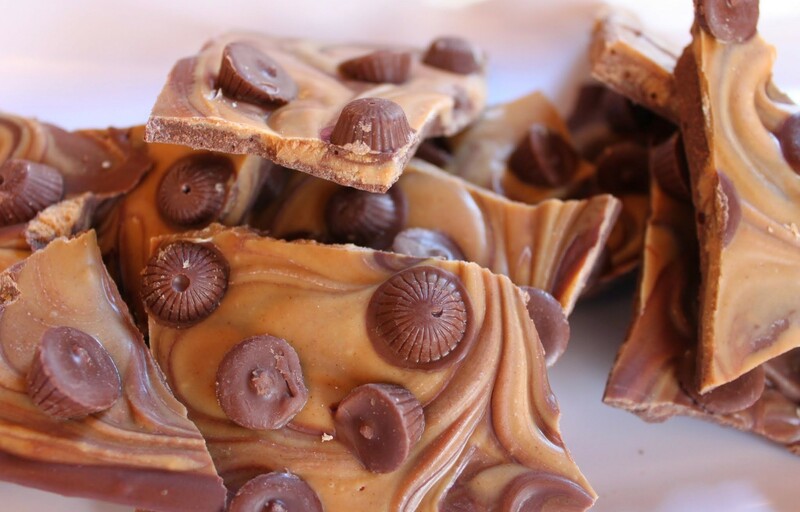 When the peanut butter chips are ready, carefully pour them over the milk chocolate layer and then gently swirl the layers. Be careful not to overdo it, or the bark will become a muddy color. Sprinkle on the peanut butter cups. Place the whole pan in the fridge for 30 minutes to an hour. Take the bark out and break into pieces. Store in an airtight container. Or eat! This bark makes a great gift as well. I don’t need an excuse to buy candy. Nope, not me. That’s a year-round grocery cart item for little ole moi. 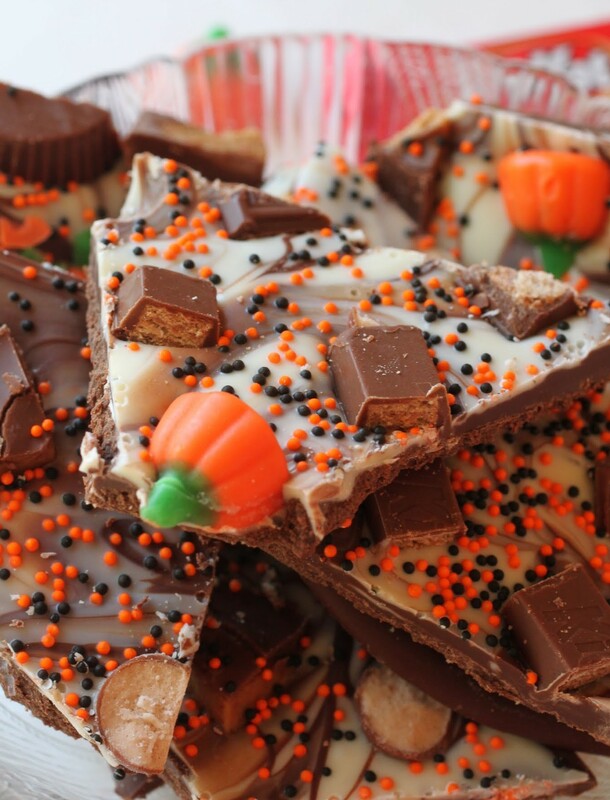 But if you use Halloween as an excuse, up the ante with some fabulous bark. 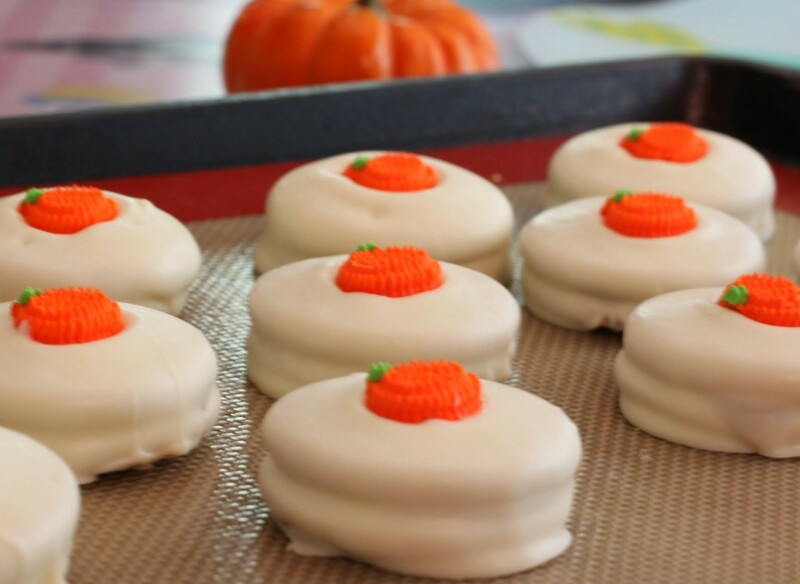 It’s easy to make, not to mention easier to eat. And it’s full of Halloween candy! Yep, you’ve got that right. Candy pumpkins, check. Kit Kats, check. Reese’s PB cups, check. Hershey bars, check. Whoppers, check. Oh, and let’s not forget about the lovely sprinkles. Or the milk and white chocolate swirly base. Now do I have your attention? Don’t know about you, but I try not to buy honey roasted peanuts too often. Why? Because when I do, the whole container goes into my mouth. To be perfectly honest, I made a batch with the full intention of sharing. Then my family fell on them like they were going out of style, so I hid a few. It might not be dignified, but it’s necessary. Seriously, best bark ever. I’d eat it ALL in about 10 minutes.